While awaiting this film, I’d like to go back to the very start of the franchise with the first Dark Horse Aliens vs. Predator Omnibus. This volume collects over four hundred pages of story in digest form for $25. Unlike Marvel's Essentials and DC Comics' Showcases, these keep the stories in full color, if not the original size. For a long time, I wouldn’t go near this franchise. It’s not because of any quality issues — it’s because, to be honest, both of the titular species scared the living crap out of me. Growing up in Baltimore, I used to go to a shop at The Mall in Columbia called Forbidden Planet (at least I think that’s what it called — feel free to correct me in the comments if you remember the store). It was amongst my first exposures to science fiction and general nerd culture. It also had life-size Alien and Predator models in the front windows which terrified me. Eventually, I saw Aliens and Predator and started to get further into their respective universes. This omnibus is my first foray into the comics, and I was impressed by what I found. The meat of the book is a pair of storylines: the initial, unnamed story (which will be called “AVP” for the sake of this review) and its sequel “War,” both written by Randy Stradley with art by Phil Norwood (Chris Warner steps in for one chapter). These star Machiko Noguchi who, in the first story, survives a hunt on the planet Ryushi, is branded by a dying Predator hunter, and eventually joins up with them. If this sounds vaguely familiar, it’s because this arc very loosely inspired the plot of the first Aliens vs. Predator film. There are a few other bits picked up by the movie, such as the sequence of the eggs being taken from the queen, but the “AVP” comic has a much tighter plot and a much more interesting main character. While Machiko is more or less a Ripley clone — pardon the Alien Resurrection pun — she has a nice character arc, going from ice-hearted office drone to action girl, driven by the desperate circumstances around her. Unlike some of the films where you root for the characters to die, the characters presented here, especially the doctor dealing the loss of her husband, actually click with the reader. “War” picks up one year later with Machiko living amongst the hunters. As they go on another hunt, she meets three other characters … from another comic. It gets a little annoying, in that the story crosses over with Aliens: Berserker, not collected in the omnibus (although it is available in Aliens Omnibus 4). The events of Berserker are explained in enough detail to get the plot moving, but this half of the story falters because of the crossover and in part because, in my opinion, Machiko’s arc moved too fast off-panel. It does wowever wrap up the storyline nicely and sets the stage for Aliens vs. Predator: Three World War, which is well worth a read, even if the trade won’t be out for quite a few months. Sandwiched between “AVP” and “War” are “Blood Time,” again by Stradley and Norwood, and “Duel,” by Stradley and Javier Saltares. The former is a nearly-silent character piece about a hunt uninterrupted by humans. This is how my dream Aliens vs. Predator movie would play out: no humans, no talking, just a two-hour bug hunt. It’ll never happen, of course, but it’s nice to see that it could actually work. “Duel,” bridging the gaps between the two major stories, is closer to the tone of Aliens, featuring the first sign of Colonial Marines in the comic. It references the “Acheron disaster” (the first film), has one of the few mentions of Weyland-Yutani, and introduces what would become part of the franchise’s nadir: the Predalien. In the book’s defense, the creature is executed much better here. Ian Edginton takes over writing duties for the final third of the Omnibus, joining up with Alex Maleev for “Eternal," with a story that I can’t bear to spoil here. This is easily one of the cleverest stories in the franchise despite an odd bit of Predator physiology that I don’t think is ever brought up again. If the new Predators does as well as I hope it should, then I’d really like to see “Eternal” adapted as its sequel. (If push comes to shove, I’d even write it myself!) Maleev also writes and draws the tantalizing “Old Secrets,” which folds the Predator into our own history and religion. The last story is “The Web,” by Edginton with Derek Thompson, and Brian O’Connell drawing the black-and-white art. This is an unexpected mad scientist tale about a character from “AVP” that I had nearly forgotten about. It seemed unfinished, and worthy of a much longer story than the one provided. After reading these seven tales, a template for the Aliens vs. Predator stories develops. Basically, humans land on a place seeded with Alien eggs, the Predators come to hunt, and the humans get stuck in the middle. Where the stories get interesting is how they play with the formula. “Eternal” and “The Web” use this formula to turn the Predators into prey; “War” and “Blood Time” go into Predator society to understand why they hunt. Because any scenes without humans are essentially silent, the authors use the room to add monologues which speculate on the creatures; Stradley especially uses the interplay of words and images to consider human culture in view of the Predators. This actually gets a little boring after a while, but the art kept my attention throughout. Thankfully, none of the stories in this volume have overly glossy, early-Image-Comics-style art despite being published in that dark, dark early '90s era. The art is surprisingly non-gratuitous; perhaps the fact that both species of creatures bleed green helps reduce the bloodiness. Norwood and Saltares have a sketchier style to their art, while Maleev’s art is shadowy and atmospheric, much like his later work on Daredevil. In all cases, the artwork is extremely detailed, with care taken to draw every Predator’s mesh outfits, every Alien’s organic ridges and the labels on every piece of human technology. None of this is lost in the shrinking of the pages down to digest size. My only art complaint is again with “The Web,” but only in that it looks like inked pencils and not like a full comic; I would love to see it fully colored and fleshed out. Thankfully, none of the bizarre yellow-green lighting that sometimes makes appearances in Dark Horse books (I’m looking at you, Dark Empire) appears here. Aliens vs. 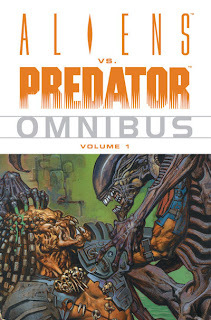 Predator Omnibus Volume 1 is a great look back to one of the backbone franchises of Dark Horse Comics. Some of it might seem cliché now, but keep in mind that this originated many of the tropes seen in the franchise. The smaller size does nothing to hurt the story and in fact might make the details even easier to see (it's also cheaper than tracking down old issues or out-of-print trades!). 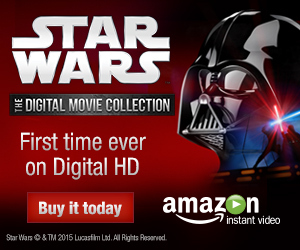 Check this out if you’re a fan of the franchise or just of science fiction comics in general. I was really interested to hear the artwork in this book isn't what one would typically expect of the early '90s. As a fan of both franchises, my assumptions about the art were really the only thing keeping me from trying this series out, so I'll have to check it out now. This review makes me really interested in reading these stories. I've been a lover of the Aliens (1-3) and Predator (1 & 2) movies since I was a kid in the '80s and always wanted to know more about these creatures. I'm glad our reviewer gives us a lens through which to look at these different stories to show they're not too similar, even if fairly formulaic.